Music of Kerala is as rich and varied as the state itself. 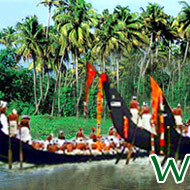 Read about different music forms of Kerala. 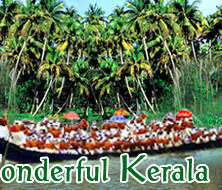 Kerala is a land of rich cultural heritage and shares the common musical culture of South India from the earliest times. Due to its common features, the South Indian music is generally known as 'Karnatic music'. 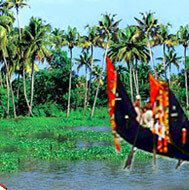 The characteristic features of Kerala music are simple structure and peculiar forms of expressions. But, it is Sopanam Sangeetam for which Kerala is known which is believed to have acquired its name from the word 'Sopanam' which means "sacred steps of the main shrine of the temple". It is believed that Sopanam music evolved and became popular through the practice of singing invocatory songs in front of Kali and later on, at the sanctum of the temple. The feeling of devotion helps Sopanam maintain its rustic tone. From the sanctum of the temples, Sopanam has taken many diversions and matured as dance music in Ashtapadiyattam. With the introduction of 'Geet Govindam' in Kerala, the system got great transformation. Kerala has maintained, in its flourishing stock, some of the rare melodies specially conceived for the purpose of adornment of certain emotions. These melodies are 'Pati', 'Indisa', 'Puraniru', and 'Kanakurinji'. Certain other ragas like 'Sri Kandi', 'Desakshi', 'Nalatha', and 'Samantamalahari' used in old devotional songs, create extraordinarily fascinating rhythms and swings of a local character. Apart from the above mentioned forms of music and melodies, there are a few other forms that count among the popular music of Kerala like Pulluvan Kuttu, a music which is closely related to serpent worship; Kathakali music, songs of which are based on microtone heavy Karnatic music; Ottamthullal music, which is based on the performance of the art form called Ottamthullal; and Mappila Pattu, which is loaded with poetry in arabimalayalam (Arabic and Malayalam) with various themes of religion, love, satire, etc. Besides these traditional music forms, Malayalam film music and Malayalam pop music is also thoroughly enjoyed in the state of Kerala.